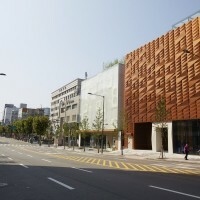 Asylum in collaboration with LOVE have designed the Johnnie Walker House, located in Seoul, South Korea. For the third consecutive year, JOHNNIE WALKER HOUSE™ continues to impress. 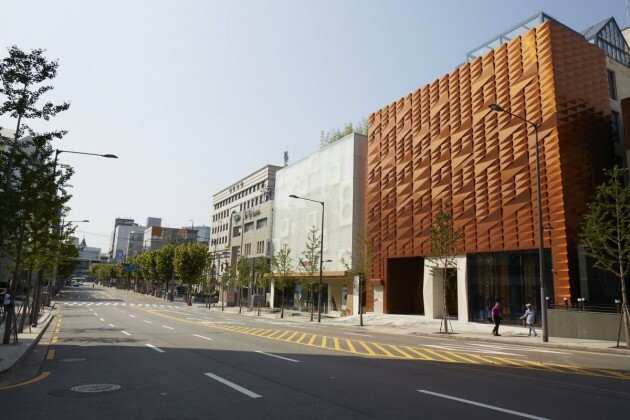 Residing in the trendy upscale neighbourhood of Cheongdam, home to the world’s most luxurious brands. 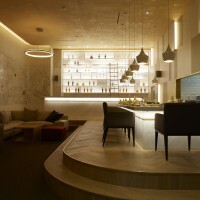 Award-winning firm, Asylum, was once more commissioned to design and create the luxurious JOHNNIE WALKER HOUSE™. Launched on September 27, 2013 by Diageo, the House in South Korea has raced ahead of its two previous Houses located in China, to be the boldest, grandest, JOHNNIE WALKER HOUSE™ yet. With 6 levels of rich Scottish Whisky heritage to boast, the House is an art of architectural excellence to behold. 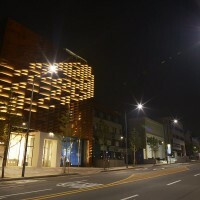 The Location – The luxury experience in Seoul is all about excellence in service and hospitality, hence Cheongdam, was a location most befitting for this premium Whisky embassy to reside, spanning a total floor area of approximately 16,000 square feet across 6 levels. The Concept – JOHNNIE WALKER HOUSE™ Seoul brings together a collection of specially commissioned sculptures by Korean artists. Modern technology spices up whisky education amidst the rich history and culture of JOHNNIE WALKER®, as it provides guests a platform to interact and engage. Various mediums as a way of initiating whisky conversations are created across the 6 floors, which includes retail, bar, private dining and interestingly a World-Class Academy. 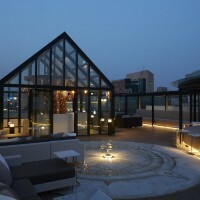 Guests of the JOHNNIE WALKER HOUSE™ Seoul can expect an immersive and luxurious whisky experience on every level. Exterior – Using the core angle of the JOHNNIE WALKER® bottle label, the copper-tiled façade is clad in the same angle, forming an impression of movement and motion as it wraps the building to express the famous brand tagline, “Keep Walking”. During the day, light catches across the copper exterior, reflecting the whisky’s character of liquidity. Welcoming guests in the courtyard is a Striding Man inspired statue, interpreted by local artist Park Chan-Girl. Retailing of PLATINUM LABEL and BLUE LABEL happens on the first floor. Creating an immersive and modern retail experience, consumers are able to interact with technology and props to learn more about the brand. Limited edition bottles are showcased within the reception desk while super deluxe whiskies are presented behind the desk. In the BLUE LABEL area, consumers are treated to a visual display of liquid expressions symbolizing the complex flavours of BLUE LABEL. VIPs are invited to enter The Blending Suite via brass doors inspired by old distillery doors, stamped with the JOHN WALKER &amp; SONS Monogram logo. Visitors are welcomed by a Constellation Wall showing the various distilleries in the 4 corners of Scotland. 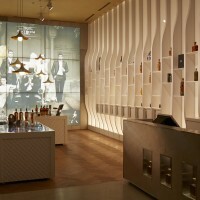 Beyond this wall, VIPs can learn more about the flavours and aromas of whiskies by using the interactive blending table. 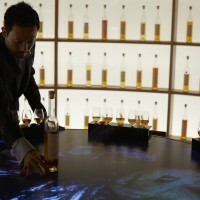 Props and video contents further educate visitors about the master lineage of JOHNNIE WALKER® and the art of blending. The Blending Suite also offers a bespoke customization experience that resembles an atelier of guild, showcasing the art and craft of collectible items with custom tailoring and material options. JOHNNIE WALKER HOUSE™ houses The World Class Academy for consumers and budding bartenders to learn the Art of Bartending and be inspired by tools, books, images and drink recipes that highlight the art and glamour of cocktail making. The space flaunts the glamour of bartending with display props featuring a mix of modern and vintage cocktail tools and equipments. Exclusive guests will be ushered to an intimate lounge where they can enjoy specially created whisky drinks, while appreciating the wall illustration depicting “Johnnie Walker’s Journey from Cardhu to Seoul”. VIP guests can also enjoy a meal at the specially designed open-kitchen dining counter, or have a private dinner at the Windsor boardroom. 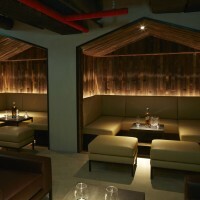 By-invite-only guests get to experience a contemporary distillery bar in the Basement. 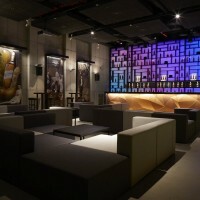 Using modern technology, unique screens behind the back bar is configured with LED technology to showcase branding and graphics whenever an event arises. VIP guests can also gain access to The Distillery from a mezzanine level by following the Peat-lined walls, inspired by one of the elements in whisky making. Contemporary furniture amidst the open bar with a view set the mood for a relaxing time out. A distillery house shares the space with the rooftop bar where guests can peek through the glass walls of the distillery house revealing a distillery model. Embedded on the ground is a compass installation that points in the direction of Scotland, stating the distance from Cardhu to Seoul and the brand message “Keep Walking”. Connecting the Floors A distillery model depicting the whisky making process is encased at the peak of the building. Copper droplets inspired by whisky emerge from the distillery model dripping down to the basement to form a visually stunning whisky installation. Created by local artist Byoungho Kim, the installation cascades from the rooftop all the way to the basement, reducing in quantity until one final drop drips into a basement pool, which resembles a whisky cask – symbolizing the final stage where whisky goes to age. 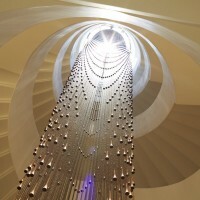 A visual spectacular while guests walk along the spiral staircase connecting the 6 floors of the House.